Dress up your engine bay with a set of carbon-look strut tower covers. Get Engine Dress Up Parts for Mustang at ModBargains. Modification Experts ready to assist. Dress up your engine bay by covering the unsightly area on top of the shock tower. These covers are made of high impact ABS plastic and are treated through a special process that gives them an awesome carbon fiber look. Best of all is that since these shock tower covers are coated, they are more durable than real carbon fiber, which tends to be fragile. 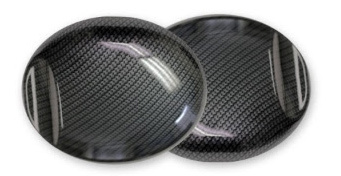 These hydro carbon fiber shock tower covers install with no tools for an easy aesthetic upgrade. Questions about these Ford Mustang CF Look Strut Tower Covers? Our Modification Experts are standing by and available to help you, online or by calling 714-582-3330. ModBargains also offers expert installation and can install this upgrade for you. Call today!